Mushroom risotto is wonderful – intense bold earthy flavours with creamy, unctuous rice – and surely is one of the ultimate vegetarian comfort dishes. I recently tried beetroot risotto for the first time and although this vibrant, crimson delight was an unusual and delicious risotto, it wasn’t enough to knock the mushroom variety off the top spot. Squash with blue cheese and crispy sage is also heavenly and is up there on the list but it’s the strong punch of the dried porcini – in my opinion – that elevates the mushroom version ahead of the rest. I’ve previously made this risotto with Arborio or Carnarori rice and produces an incredibly creamy and satisfying meal. Using pearl barley as an alternative rice gives a slight bite and nuttiness to the dish that is very different but by no means less enjoyable. It’s also a lot easier to cook than Arborio rice as you can add the liquid in one batch then leave it to absorb, rather than the more labour intensive method of adding the stock in small ladlefuls combined with lots of constant stirring. In an ideal world, you would make this dish with wild mushrooms during autumn when they are in season. However, they are eye wateringly expensive and I live in zone 2 London so sadly foraging for my own is out of the question. This surely is a reason alone to move out of the Kilburn urban jungle to living The Good Life near woodland, countryside and open space. For now the supermarket will have to suffice for the mushrooms required and varieties such as portobello, chestnut, enoki, shitake and oyster are widely available. 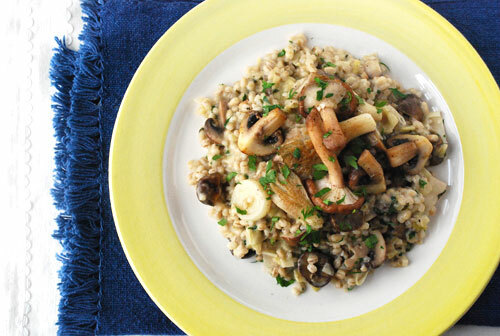 The risotto will make much more interesting eating if you have a medley of mushrooms with different flavours and textures, so see what you can find. If you can’t source a mixture of mushrooms then increase the amount of chestnuts. I have borrowed Jamie Oliver’s method of introducing some mushrooms at the beginning and then the remainder at the end that I fry over a high heat until golden and use to top the risotto. It all makes for a taste sensation risotto so tuck in and enjoy! Why not post your suggestions for other risotto recipes you consider the best and think will rival my mushroom one? Put the dried porcini in a jug and pour in 250ml of boiling water. Set aside for 20 minutes to infuse. Drain, reserving both mushrooms and the soaking liquid, ensuring any grit at the bottom gets left behind. Combine the porcini liquid with the vegetable stock into a saucepan and put on a low heat. Roughly chop the mushrooms and set aside. Heat 25g of the butter in a large frying pan over a low heat until foaming and then add the leeks. Fry gently until beginning to turn translucent, about 8 minutes, add the garlic and cook for a further minute. Add the pearl barley and the tarragon to the pan and give a good stir so that so everything is well combined. Turn up the heat, add the white wine and bubble until almost absorbed. Add half of the mushrooms and all of the hot stock. Stir well and simmer on a low heat until the liquid has nearly absorbed. This should take about 15 minutes. Put a frying pan over a high heat, add the remaining butter and a tablespoon of olive oil. Fry the remaining mushrooms for about 1 minute, with some salt and pepper until golden all over. Stir the chestnuts into the risotto, along with the crème and parmesan. Heat through for about a minute. Serve the risotto in bowls topped with the fried mushrooms, a scattering of chopped parsley and some extra grated parmesan. This entry was posted in Vegetarian and tagged chestnuts, dried porcini, leek, mushroom risotto, pearl barley, pearl barley risotto, wild mushrooms on 15/01/2013 by Val McArthur. Made it tonight — excellent! Thanks again for sharing. Sorry about that, I’ve just added the rest of the instructions now. Where is the rest of the recipe instructions? ?